Page 201 - Seeking answers? Join the AnandTech community: where nearly half-a-million members share solutions and discuss the latest tech. Somehow missed reading the ServeTheHome forum thread earlier. This probably won't be an issue at all for most regular systems (i.e. laptops and desktops). Systems that are powered/used 24/7 might be at risk, though. Well, that took friggin long enough to arrive... 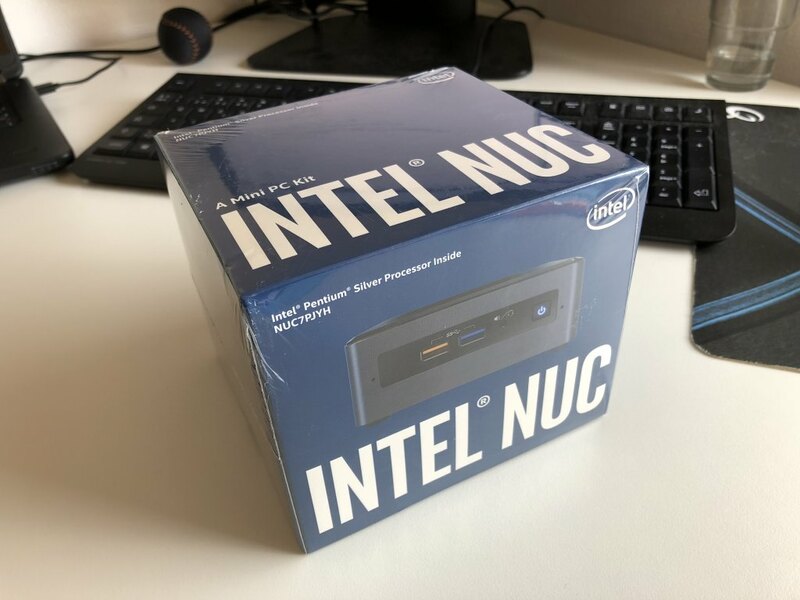 Finally got my NUC7PJYH (Pentium J5005) today, more than two months after I ordered it. Looking quite good! This is with 2x4GB DDR4-2133 CL15. The HyperX 2400 MHz CL14 did not boot, as expected. Why did it not boot? Doesn't GLK support DDR4-2400? This memory is arranged and specced in a way that ”should” make it compatible. However, it simply doesn’t work, for unknown reasons. This incompatibility was first reported by NUCblog when reviewing the NUC7CJYH, so I wasn’t expecting it to work. Had some bog-standard Crucial 2133 MHz sticks in another NUC (Skylake i3), so I simply swapped (the Skylake NUC had no issues with the HyperX sticks). Out of curiosity, does anyone care to check how this compares to Cortex-A72, A73 and A75 running under a 64-bit OS? EDIT: I'll be posting a bunch of benchmark results tomorrow. If there's anything in particular you want me to test, now's the time to tell. AIDA64 memory benchmarks, and personally, I want to see throughout in BOINC project TheSkyNet POGS. Intel Atom Z3735F Silvermont 1583 MHz can do 815 credit/day per core (0.515 credit/day per MHz); Core 2 Duo E8600 Penryn 3580 MHz can do 2422 credit/day per core (0.677 credit/day per MHz). I wonder how far the Atom class progressed here. Extreme memory latency looking onerous.. Sadly Intel gave up with the development of Android on X86 instead to ask AMD and VIA to help with it..
Other than the memory score, its pretty much neck and neck. You sure about that frequency on BOINC? Because it has burst frequency of 1.83GHz. Yes, the all-core frequency: checked in Windows using HWiNFO, and then in Linux Mint (64-bit on Bay Trail) using lscpu. The latest version of 64-bit Windows installed just fine and I downloaded the latest drivers from Intel's website. All results below are on a 1440p display hooked up to HDMI and the latest version of Chrome / Edge. Scores are Chrome unless otherwise noted. Cinebench R15 score of 265 (faster than the listed i5-3317U score of 214). which is kind of nice for a "10W Atom"
On that note ... it's on my desk and if there's a fan, I've never heard it. In resume, this old piece from 2015 despite the SW compatibility issues, is still strong. What does a Goldmont core chip get per MHz? I assume that it takes advantage of multiple cores? Is it nearly linear, that a 2 core Z3735F would make it half the score? Meaning a Penryn is 2.6x as fast per core? Or does it gain less than 2x with double the cores? Okay, here are the benchmarks! I've included my own Pentium J4205 (Apollo Lake) results where available and calculated the performance difference. Please note that the J4205 results are from Nov 2016 and used a different version of Windows as well as a much older graphics driver. I observed the J5005 clock frequencies during an MT run of Cinebench R15. The CPU starts out at 2.7 GHz on all cores, but after ~1/3 of the test it settles down on alternating between 2.4 and 2.5 GHz. It looks like the J5005 is 30-35% faster than the J4205 on average. I haven't done any extensive comparisons of operating frequency, but I'm guessing the J5005 runs at roughly 5% higher frequency. So average IPC improvement over Apollo Lake is probably in the 25-30% interval. Pretty impressive. Using Geekbench 4 for comparison, the J5005 seems remarkably close to the IPC of the Nehalem-based Core i5-760. Not spectacular performance for 2018, but I'd finally call the "Atom" pretty usable. This NUC, with a 256GB Crucial MX100, definitely doesn't feel slow. Single core performance appears to hover around 4 times that of the original Atom N270 (1.6 GHz) released in 2008. After the table below, I've included URLs to some of the results (Geekbench/3DMark). personally, I want to see throughout in BOINC project TheSkyNet POGS. Intel Atom Z3735F Silvermont 1583 MHz can do 815 credit/day per core (0.515 credit/day per MHz); Core 2 Duo E8600 Penryn 3580 MHz can do 2422 credit/day per core (0.677 credit/day per MHz). I wonder how far the Atom class progressed here. Extreme memory latency looking onerous.. I spent an hour trying to get BOINC Manager to add the project, but it would always fail with a message along the lines of "Couldn't add the project. Please try again later". Yay... Tried two different BOINC versions and even attempted using boinccmd. Got a different error message there and decided to give up. While it might be pointless to compare to ARM, it's still fun from a "what-if" perspective. It does appear Goldmont Plus is very competitive with current high-end ARM-designs (excluding the big cores such as Apple's A11), from a pure performance perspective. It's of course almost impossible to draw any firm conslusions regarding power efficiency, though. Completely different systems, design goals and far too many unknowns. Identical graphics configuration, but graphics performance went up by that much? I don't have a Goldmont processor to run. The project tasks are single-threaded. First, I get throughput by running an instance on each thread, then divide by number of cores. So, one can say the Penryn is 2.6x the performance per core of the Silvermont, when all cores are active. That's fine. The project doesn't have any tasks ready to send at the moment. From CPU performance perspective somewhere between Snapdragon 835 and 845. However if looking at SoC level in particular GPU the J5005 is far behind. J5005 is essentially generations behind. In addition the Snapdragon 845 only consumes 4.38 W while running GFXBench Manhattan 3.1 offscreen as measured by anandtech. As a what-if, we have to consider their graphics has been standstill since late 2015. They've been hit by the unexpected delays to their process, not only their 10nm, but 14nm as well. The same problem their CPU division has been hit with affected their GPU team. It looks like the "Atom" team has planned in advance though. A desktop oriented chip like the J5005 also exaggerates the TDP differences. I doubt the 6W TDP N5000 is more than a little bit slower than the 10W J5005. Maybe drivers? I assume CPU is helping quite a bit as well. By the way, notebooks and tablets using Geminilake is supposed to arrive in mid to late May. I've been wanting to get my hands on the Gigabyte mITX J5005 board, and I can't see any. Probably why. That is no excuse if we assume that Intel 14nm is as advanced as TSMC 10nm. Others have advanced well ahead of Intel while not having a better process. The difference compared to some year ago is, that Intel cannot bank anymore on technological superiority - and the weakness of architecture starts to show. TDP is a quite useless measure if we are talking actual power draw at a given workload (aka power efficiency). For certain low power workloads the performance between N5000 and J5005 might be similar but at one point the 6W limit kicks in and the 6W SoC starts to throttle, which widens the gap. This is typically the case if you look at combined CPU/GPU workloads. Other than this I do expect power efficiency precisely the same between N5000 and J5005. Your post should include the fact Intel did not plan on having 14nm for so long. Skylake's Gen 9 architecture is what's used in Goldmont, and Goldmont Plus. Had they planned for it, we might have seen a variant of future GPU architecture(Gen 10 and 11) on the 14nm, improving performance and efficiency over current graphics. For the CPU cores in Geminilake, it was planned on 14nm, thus we saw significant improvement despite being on 14nm. We did say "what-if" didn't we? Laughs why would you want to use power vr with atom? Power vr drivers for Windows has been a joke and always been a joke. For example in 2012 atom released it's first semi serious tablet hardware with clovertrail. It used power vr tech and trust me it sucked due to drivers. You were lacking basic functionality like if you had a 1280x800 screen and you did a full screen app it could not strech the screen for an older full screen program thus if the app was coded for 800x600 or a smaller resolution you lost 33% of your vertical height for 1280x800 screen. Only 1:1 pixel mapping was allowed in the driver's. And there were far more limitation with power vr drivers including constant crashing it was just bad. Crappy netbook hardware and the GPU was half the mess. So much better with the switch to baytrail for the Intel you drivers actually work. Now power vr graphics is good for Intel but atom is dead more or less in Android. Furthermore who knows the future for imagination now that it is acquired by that Chinese company (got a new CEO a few weeks ago). Remember imagination lost half of it's revenue when apple left. Before being acquired imagination did 350 layoffs and when the acquisition was announced they said there was going to be more layoffs with the restructuring. Furthermore before apple pulled the plug on imagination it was hiring away talent from imagination including the coo and the heads of several divisions involving both hardware and software in powerVR. Beside probably the best talent being poached how do you attract and retain talent with things like stock options when a company takes a beating and the acquirer does not see the division as a growth opportunity and is thus more stingy for it is downsiding so both less people and less talented people and the ones who remain have worse moral. So remind me why power vr for Intel atom is a good idea again?